Whether you want to enjoy latest movies, sports broadcasts, or listen to best radio stations, we have just the thing for you. Meet the remarkable EBox Q Box – one of the Best Value Android TV Boxes. Don’t let this little guy fools you because even though it is tiny (the size of your palm), it is quite powerful. With this little guy at your home, there will be no limitations. It works smoothly, it offers a plenty of space to store media files, and it looks stylish. The icing on the cake is the price – this amazing media player device is very affordable, and trust us, it is worth every penny. Of course, no product is ideal, so obviously this one also has its own flaws, but this device is very popular and there are some good reasons for that. Therefore, let us see what this little stylish box has to offer you (one thing is for sure, you won’t be disappointed). We bring you an in-depth review of EBox Q Box in order to show you what this device can do. Clearly, when you see this handy device, the first thing that comes to your mind is its sleek and compact design. 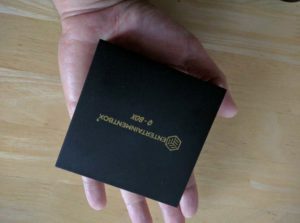 Measuring 90mm x 90mm x 20mm, this TV box is the size of a palm. This makes it an ideal choice for those who have limited space in their home or simply want a sleek and compact device that will not take up a lot of space. It also comes with a handy little support to attach the box behind the TV, wall, tv stand, wherever you want, if you want. In addition, the material feels solid and smooth. Another thing that adds up to the design are the ports. 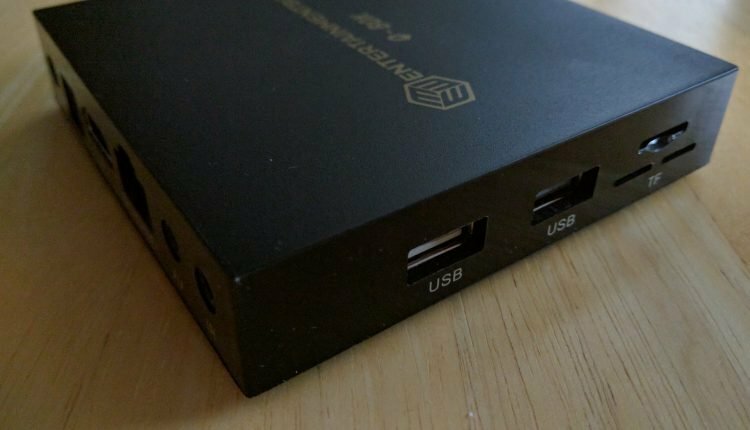 All of them (2 USB and 1 micro USB port, an Ethernet and HDMI socket, and audio jacks) are placed on the rear of the device for clutter-free space. Want to know what this little guy has underneath? Here is the specification chart, to give you a better understanding of what you get with the EBox Q Box. I/O Ports 10/100 Ethernet, HDMI, Micro SD, IR Receiver, Optical Audio out, Power Port. 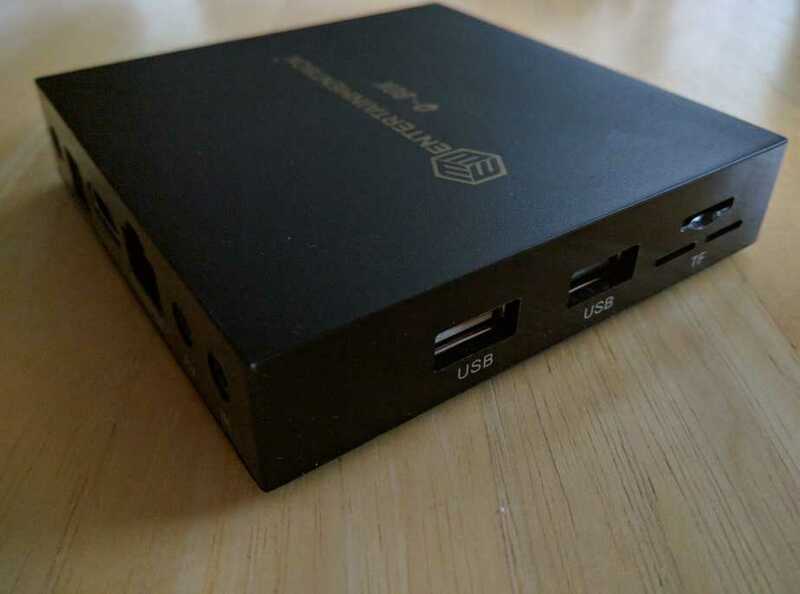 What makes this little guy one of the best value android TV boxes on the market is its performance (together with its price). Compared to other models on the market, this one excels in performance, thanks to what it is inside the box. The device provides great user experience since it makes every single operation easy and fast. The Quad core processor ensures fluent and smooth navigation of the system menus. Moreover, the device is perfectly capable of multitasking. The Android 6.0 Marshmallow OS makes this device even more functional. Thanks to this operating system, you will have better performance and access to an array of applications that you can find on the Google Play Store. This means that you can find just the perfect apps for you. Not only that, but this device also features EBMC. In other words, this is a version of well-known Kodi, specifically made for this little device. EBMC/KODI is a great little app that allows you to stream series, movies, live TV, or really any online media. Meaning, you get access to the most famous media center software in the world. EBMC works better than Kodi on Android Devices, as it contains many android bug fixes and better support. Of course, the EBox Q Box doesn’t come with EBMC/Kodi add-ons, since this would be illegal. But, you will be able to install some of the best Kodi Add-ons and make everything even easier for you. No need to worry about the memory storage, since this little device offers onboard 16GB for storing your favourite media. So, you can finally make your movie collections and upload them to the internal storage. This is great for rainy days when you just want to take a cup of tea and watch your favourite romantic, adventure, or drama movies. However, if you prefer to stream, you have plenty of Kodi addons available to install and use. Check here the Best Kodi Addons. Another feature worth mentioning is the graphics processor. Compared to other Android TV boxes on the market, this one comes with a high-quality graphic processor, very good for it’s price. Furthermore, the device is capable of supporting 4K video for both 4k video files and 4k streaming. If you’re looking to buy a smart TV box solution that isn’t complicated to use, this is the way to go. You just need to connect it to your internet by wifi or ethernet cable. To do so, just access settings. In less than 3 minutes, you will be ready to use this little device. No need to worry whether the navigation system is filled with advertisements. The only thing you will see with this little device are your applications and some EntertainmentBox Apps with guides, support, OTA updates and their own apps store. As far as the dashboard is concerned, you will surely appreciate its simple and concise look. As you will see, the user interface is separated into two screens (a home screen and a second screen). At the home screen, you will find all of the necessary HTPC icons, together with access to EBMC. The second screen contains frequently used apps, while also giving you the possibility to set those which you love the most. Not only the applications are a breeze to install, but they are also easy to access to. 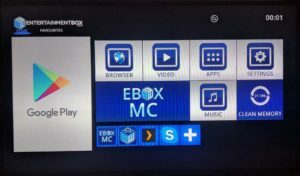 When it comes to what you get with the EBox Q Box, it comes preloaded with every app you would want – from a web browser, access to Google Play store, to BBC player, to YouTube and Netflix, and more. Additionally, this device isn’t locked down like many others on the market are. Plus, it offers file management tools that will help you with many tasks. All EntertainmentBox devices come with Kodi installed but no third-party Kodi addons are installed, so you will be buying a legal box. If you want, you can then install your favourite Kodi addons on it. EntertainmentBox offers a fantastic 24/7 free support via email, facebook, twitter and youtube. Moreover, the company offers a 30-day money back guarantee and a 12-month warranty, most sellers just offer 6-month warranty. With Android 6.0 Marshmallow operating system, EBMC, the Octa-core processor, and good graphics processor, the device makes every operation as smooth and fluid as it can be. Considering its good features, performance and price, this device can definitely be considered the Best Value Android TV Box. 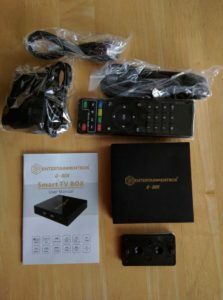 However, if you want the best box 2017, from the same manufacture (EntertainmentBox) , then you might want to check the great EBox T8 V.
If you’re looking for an Android TV Box with the minimum requirements and the best price possible, EntertainmentBox released the EBox Q-Box Lite Version – the best option for tight budgets. The differences between this model and the previous one are in memory, internal storage, and of course the price. While the previous model has 2GB RAM, this one has 1GB RAM. Moreover, the EBox Q offers 16GB ROM, and the EBox Q-Lite offers only 8 ROM. Apart from these two differences, other features are exactly the same as those on the previous model that we’ve reviewed. All in all, this is one mean little device. Featuring the Android 6.0 Marshmallow operating system, you can enjoy almost all applications that are available on the Google Play Store. Moreover, this device is one of the best value android TV boxes on the market when it comes to ease-of-use. Lastly, this model is the best low-budget option for those who want to buy a quality TV box that will perform smoothly, without actually spending too much money on it.